The Road To Freedom takes the reader back to a time when 70,000 young Indians waged war against the British Empire During World War -II , the Indian National Army (INA) developed from a band of PoWs into a fighting machine that devastated British defences on India's eastern borders. 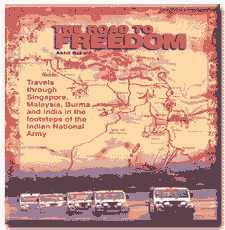 Fifty years later , the Azad Hind Expedition retraced the route taken by the INA - driving through Singapore , Malaysia, Burma and across the breadth of India from frontier Manipur to the Red Fort at New Delhi the final goal of the liberation army. The Road To Freedom brings the expeditions journey vividly to life, through its evocative text and superb photography . The book also contains several rare and extraordinary action-photography of the INA and its heroes. Accompanying the Azad Hind Expedition were three battle -scarred veterans of the INA , each a legend in his own time : Col Gurbaksh Singh Dhillon ,Col Lakshmi Sehgal and Capt SS Yadava. As the Expedition traverses those thick jungles and deep rivers , the high mountains and scorching plains treaded by the braves of the INA , the veterans recall those glorious days through the mists of memory. The text contains hair-raising accounts of the battles won and defeats suffered ; picturesque descriptions of the Expeditions adventures in distant lands . Mixing the story of the INA with insightful observations of local people and customs , The Road To Freedom is a highly unique portrait of 20th-century politics and travel. The Road To Freedom is sumptuously illustrated with outstanding photos taken by the author and Kabir Khan. Pictures that put us in touch with the people and spirit of the land: the bustling city-state of Singapore with its manicured highways; snarling Coconut Monkeys; the muddy Gulf of Martaban dotted with wooden crafts ferrying villagers to its flat shores; the famous Moulmein pagoda "lying lazily by the sea"; worshippers at the colossal Golden Rock perched precariously in space, balanced by Buddha's hair; the gem-studded dome of the Schwedagon Pagoda shining bright under a full moon; the sprawl of exquisitely carved, ancient temples at Anantapur; the colourful floating market of Inle Lake; the Giraffe Women of the northern jungles of Burma..... over 120 colour plates.